The Combined Cadet Force continues to gain in popularity at the school with well over 300 cadets, representing almost half of the school community. The contingent consists of Army and RAF sections of roughly equal size and is one of more than 200 such contingents based in schools throughout the country. Membership of the contingent is entirely voluntary, with pupils choosing to join when they enter year 9. We also offer a fast-track scheme for new-entrants to the sixth-form. Our best cadets are invited to continue their membership whilst in the sixth-form to act as cadet NCOs and undertake the majority of the instruction of other cadets. The Combined Cadet Force is a youth organisation which is sponsored by the Ministry of Defence. Its purpose is summarised by the CCF charter, but in essence is about developing our pupils to be full citizens in the future. The contingent parades after school each Friday. Cadets undertake a variety of training, including drill, navigation, first aid, leadership, military knowledge and sectional training such as fieldcraft or principles of flight. 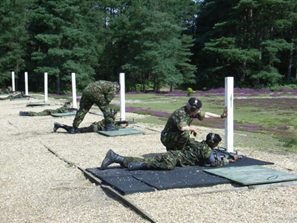 Cadets have the opportunity to learn to shoot under carefully controlled conditions, using both the small bore range on site and on full bore ranges whilst at camp. The contingent enters several teams in BSSRA competitions. Once a term the whole contingent undertakes a field day, where we travel to a local army training area to put into practice the skills cadets have learnt at school. For instance in the summer all year 9 cadets complete a 24hour self-reliance exercise where they have to build shelters and cook for themselves in field conditions. The real benefit of the CCF to cadets, however, lies in the huge range of opportunities that are on offer to them. The RAF section regularly goes flying and gliding at nearby RAF Cosford and several older cadets complete gliding scholarships where they get the opportunity to fly solo. Both sections run annual camps which all cadets are encouraged to attend, at Easter for the RAF section and in the summer for the Army section. The CCF is one of the main users of Farchynys, with 7 events each year. These range from simple introductory weekends to adventurous training in the local mountains. There are also several weekends each year at local training areas. 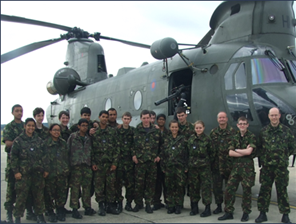 The MOD provide many courses which cadets canccf6 attend. 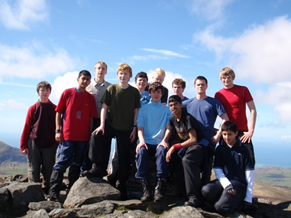 Recently we have had cadets complete courses in signals, rock climbing, cookery and leadership. There are also international opportunities: each year some cadets travel to camp in Germany and Cyprus, and recently we have had cadets involved in exchanges to Canada and Israel.